We drove the petrol Honda Civic back in 2017 & we were impressed with 1.0 litre petrol , mainly because it’s fuel economy is excellent. It was interesting then to spend a week in the 1.6 i-DTEC EX diesel version, which like it’s petrol brethren comes completely re invented. As my second ever company car back in 1990 was a Civic, third generation, I have seen the car grow in both popularity & size in the intervening years. I’ll admit to having a soft spot for the various Civic’s that have come since then. However, from a corporate perspective, Honda has seen fleet sales drop considerably over the past few years, primarily because of a lack of competitive engines between 2010 & 2017 & a chop & change policy of how the company would move forward with it’s corporate dealership network. The addition of a diesel means that they now have all bases covered. The new model certainly looks striking. The front & rear of the Civic almost mirror each other The front sports aggressive wrap around headlights merging into an all-black front grille. The rear features bulbous rear lights & a curved low slanting rear window. Inside there is a change. The familiar “spaceship” Honda dashboard from the past two incarnations is gone, replaced by one that’s more conservative, with a mixture of soft touch plastics. It all works, looks functional & is easy to use & to understand, but I kind of missed the old Honda, who took the boring norm in most cars, put it in bag, shook it up a bit & produced something a little more interesting for the driver to inhale. The quality of the dash & controls is better than in previous Civics & leans towards that found in it’s mainstream competition. The seats are comfortable if a little bland & there’s more room in the cabin than there appears from the outside. The real bonus is with the boot. 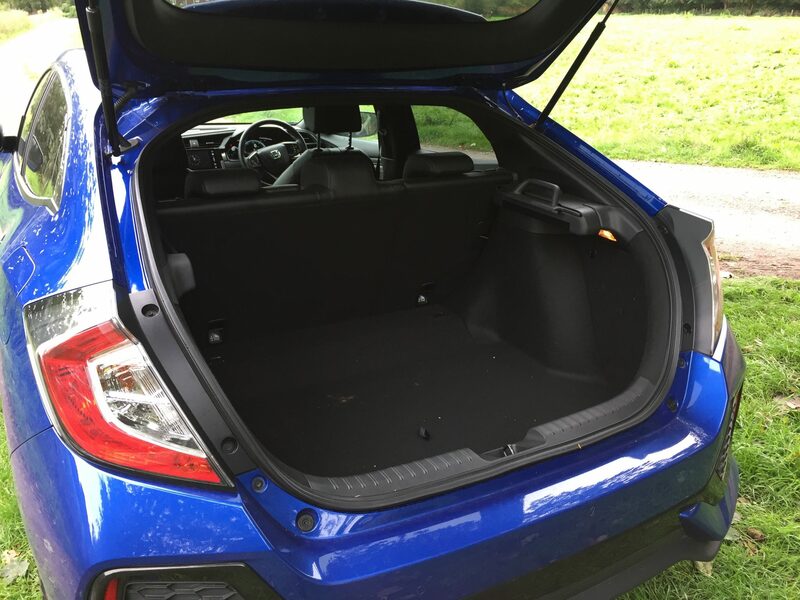 It’s a great size 478 litres, with a hidden compartment underneath the boot base. Fold the rear seats down and they lie flat making a truly ” IKEA fabulous ” load space of 1267 litres, way ahead of most of the competition. On the road the new Civic is barely recognisable from its predecessor. New multi-link rear suspension means body control is good, while sitting in the driver & front passenger seat is very comfortable. It’s close to the ground as well. Although the new Civic is larger than the previous model, it’s 148mm longer & 29mm wider, it’s also 20mm lower, with a centre of gravity that has moved down 34mm. You do feel close to the road. 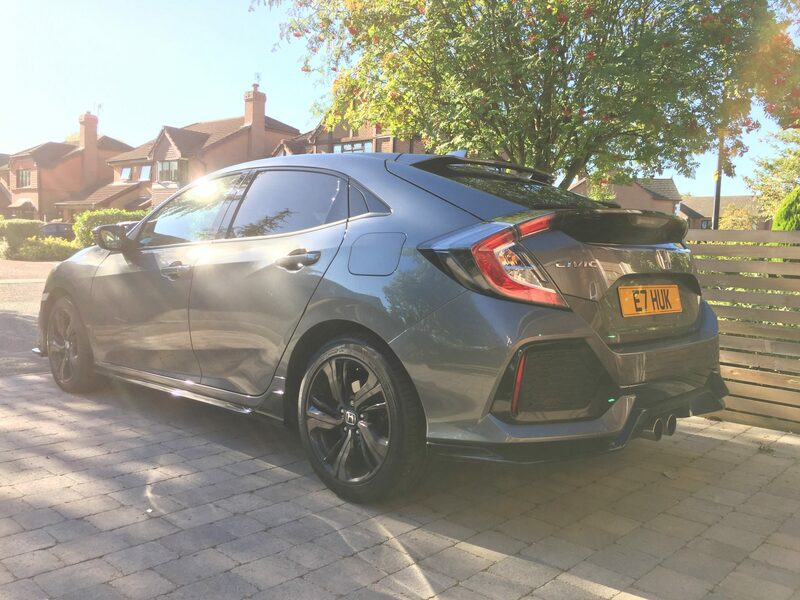 Whilst most new models launched recently, have got lighter, the Civic is actually heavier, 91kg to be precise, than the Mk9 which undoubtedly harms fuel economy. This extra weight doesn’t though, spoil the driving fun. The steering is light, whilst the manual six-speed gear box is a beauty, with a short, slick change only enhancing the enjoyment. The 1.o litre petrol, manual 6-speed version will do everything that you want your car to do, within reason & is especially good on the motorway, once your’e up to speed. However, the 1.6 diesel would up until recently, have been the obvious company car choice & after seven days in it, I still think it has a place on fleet managers possible list. In order to see just what I could get fuel wise out of the diesel Civic, I drove the entire week & 500 miles in Eco mode. The 1.6 litre engine was a great motorway companion, with my longest motorway round trip of 230 miles seeing the diesel achieve 60mpg. Top speed is 125mph with a 0-62mph time on my EX test model of 10.2 seconds. Honda claim a combined fuel economy of 80.7mpg on the diesel, which if possible would be brilliant. However, when I spent most of my next 250 mils driving more slowly on a mix of urban & A roads, my fuel economy fell to 55.6 mpg. Before you groan though, a week in the 1.5 petrol Civic saw my combined figure flutter around 45mpg. So the diesel unsurprisingly is about 20% better. With an asking price of £25,450 the EX diesel offers great value too. Heated front seats, Smart entry & Start, a leather interior, Cross Traffic Monitor & blindspot info are offered on the EX. 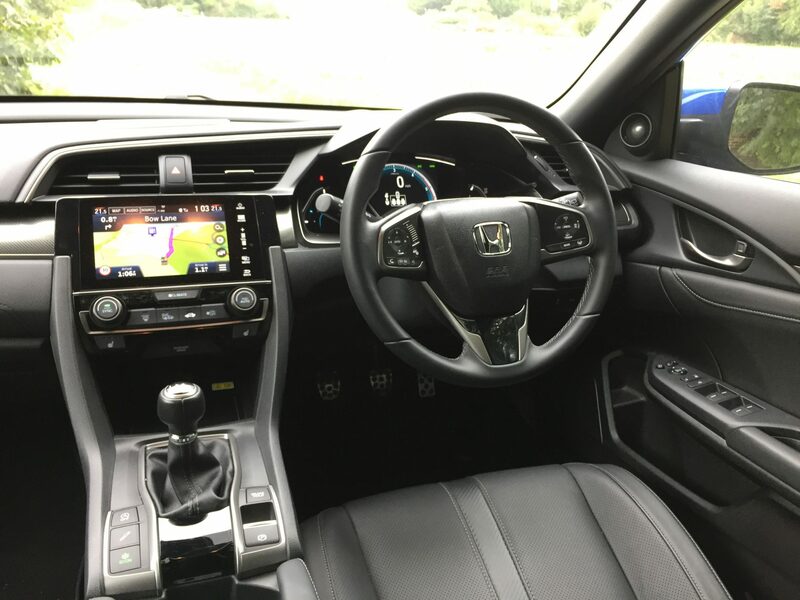 Plus ,it also features 17″alloys, dual zone climate, rear parking camera, privacy glass, leather steering wheel & shift knob & Honda Connect with Apple CarPlay & Android auto, all of which also come fitted to the lower specced SR model. So how does the diesel compare ? Your petrol choice is either the 1.0 litre Civic, which offers great value for money, especially if you go with the entry level SE or next up EX model, with decent mpg & emissions, or there is the more expensive 1.5 litre version, which is better equipped, faster & quieter but comes with the caveat of decidedly average fuel economy & emissions. That then leaves the diesel 1.6 which for us averaged 55-60 mpg & beats both the 1.0 litre petrol the 1.5 petrol by about 10 mpg. It’s not an easy decision, but if you drive in excess of 20,000 miles per year, the diesel will use considerably less fuel. If you want a 5 door family hatchback that offers practicality, good performance with acceptable fuel economy & your mileage is low, then look no further then the 1.0 litre petrol manual version of the Civic hatch. 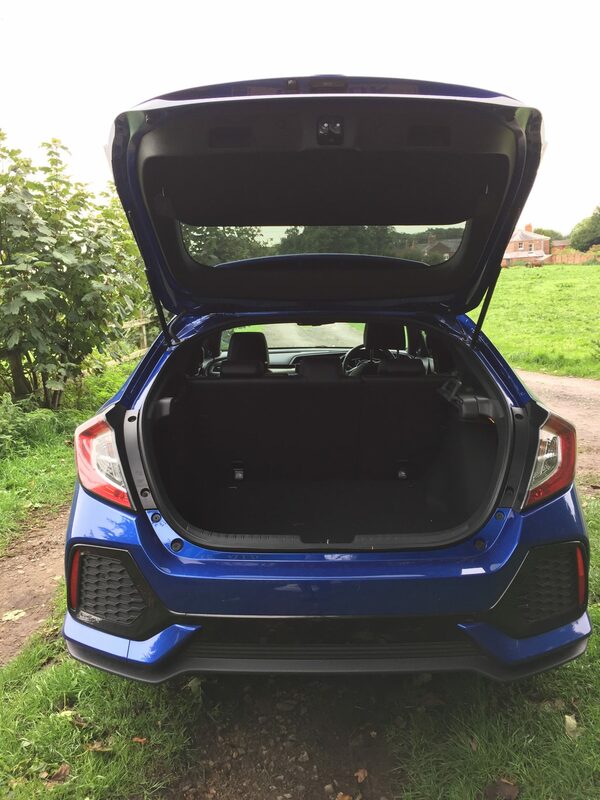 The diesel is more frugal & if your job entails lot’s of motorway use & 15,000 + miles per year then it’s the most logical choice.The addition of a saloon version this year which offers a larger boot & better interior space, can only enhance the potential of the Civic, which is a great all-rounder & a very easy car to live with. Diesel’s still in the game 3.5/5.